The guards ignored us, manhandling the man for several minutes and then finally letting him go, leaving him lying half-naked on the ground. One of the onlookers paid for the milk, and the guards went back into the shop while the dazed old man struggled to sit up, still clutching his meagre prize. I went into the shop and complained to a manager. He was well-trained in the art of placating customers, giving me a smooth-tongued response. Yes, the guards were perhaps a little over-enthusiastic, but the man was a persistent offender who was well-known to them, and they have a duty to stop shoplifters. I protested and eventually left, but the incident has continued to haunt me. Banksy understands that haunting perhaps better than any other contemporary British artist. His new exhibition at Bristol Museum and Art Gallery - Banksy Versus Bristol Museum - is defiant, witty and courageous. It is a triumph of dissenting liberality over the increasingly authoritarian regimes which seek to control our diminishing spaces of democracy and freedom. 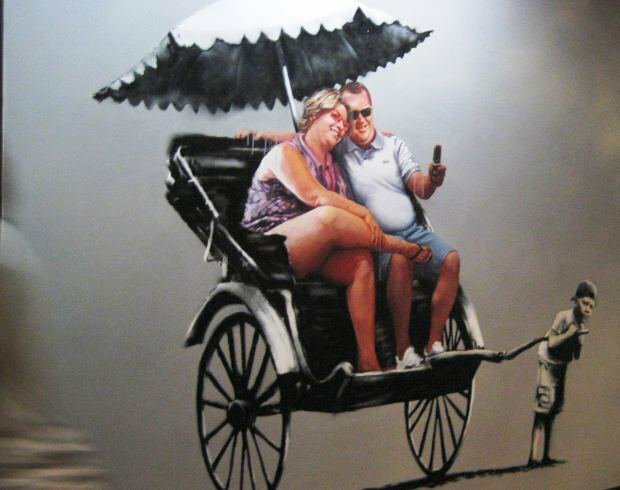 Bristol is Banksy's home town and this is the biggest ever exhibition of his work. It is a credit not only to the artist himself but to museum director Kate Brindley for the risk she took in handing over the entire building to a secret project, with only a few employees knowing why the museum had been temporarily closed. The result is a vindication for the few involved in the exhibition's planning and the larger team who created the installations. Even in the show's early weeks (it runs from 13 June-31 August 2009), there are long queues to get in throughout every day. The people of Bristol clearly approve of this tribute to the city's most controversial cultural icon. I wonder how many are visiting the museum for the first time and discovering its abundance of less sensational pleasures, as they wander the galleries looking for Banksy's interventions among the display-cabinets and gilt-framed paintings. The exhibition is free and there is no merchandise for sale. Banksy is paying all the costs. It is a rare example of public benevolence in a society where so many - including many of the country's MPs - seem to have been more concerned with personal economic advantage than contributing to the common good. In an exhibition of such magnitude some works are inevitably better than others; taken individually, one might carp at the silliness of some of the pieces or the lack of subtlety in some of the political messages. But the overall impression is exhilarating, and to see so much of his work in one place gives an opportunity to experience the genius of the enigmatic graffiti-artist who calls himself Banksy. There is much in the exhibition to laugh about and much to rage about, but there is also a profound sense of the vulnerability as well as the absurdity of the human condition. It communicates (at least to me) the wonder of belonging to a species which produces great art and ideas but which has a capacity to laugh at its most sublime achievements, as well as its most abject failures. This is art which combines accessibility with significance. So much modern art uses obfuscation as an excuse for profundity. Banksy reminds us that democratic principles must be shared , and that art must be able to communicate in the language of people's lives. 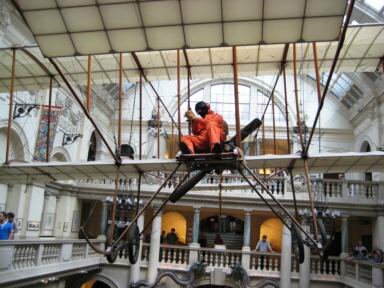 The central atrium of the museum is dominated by a replica of an aircraft known as the Bristol Boxkite, which hangs suspended from the ceiling. But look: the pilot has been replaced by a man in an orange jumpsuit, in an exhibit titled "Escape from Guantánamo Bay". (Banksy has in the past smuggled an inflatable Guantánamo prisoner into Disneyland). Beneath the plane, the enquiries desk has been rehoused inside a burned-out ice-cream van. The lobby is home to a range of installation pieces surrounded by classical sculptures of feminine beauties touting shopping-bags, checking the price on a pair of sunglasses or drinking out of a can, cigarette in hand; one is of an angel standing with wings outstretched, a tin of pink paint upended on her head. In one installation, a CCTV camera keeps watch over her chicks, regularly turning a baleful eye towards her observers. In another, a mournful, featherless Tweetie Pie glowers out from a perch in her cage; nearby a caged artist-monkey wearing a beret sits at his canvas. There are fish-fingers swimming around in a giant glass bowl, and chicken-nuggets hatching from an egg and pecking at their food while a mother-hen looks on. A leopard reclines elegantly on a branch, curling and uncurling its tail, but step round the back and you discover that it is actually a leopard-skin coat. The political edge of such images becomes more pointed in an upstairs gallery, where a bloody placard that refers to the controversy over fox-hunting in Britain has been placed next to a stuffed fox in one of the glass cabinets - "Fight Prejudice. Fight the Ban". The ground-floor gallery is home to an array of images which brilliantly exemplify the artist's unsettling ability to provoke at once moral outrage and laughter. 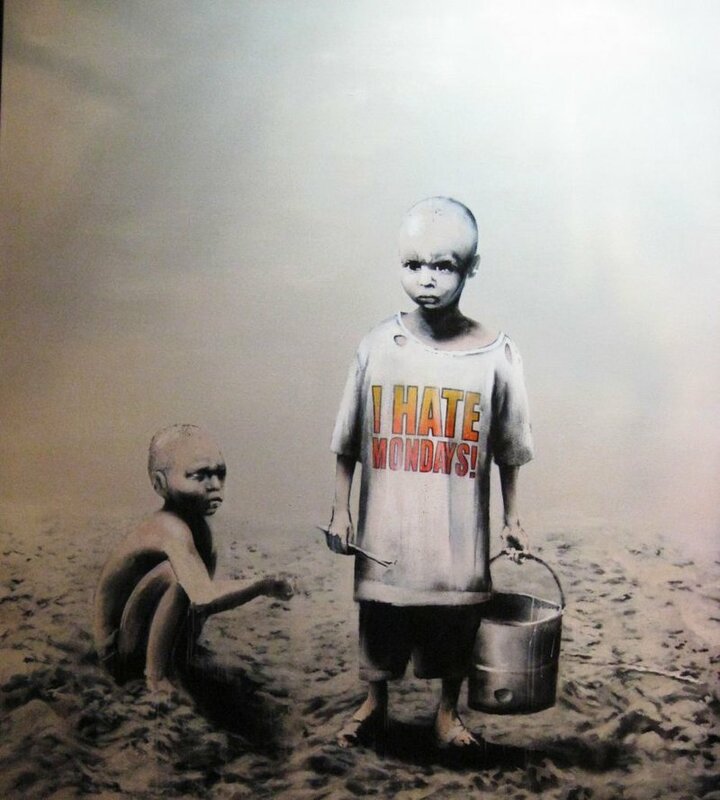 A pair of corpulent tourists sits in a rickshaw taking photographs of the emaciated child who is pulling them along; nearby a hungry child holds an empty bucket and gazes at the viewer, wearing a t-shirt emblazoned with the slogan "I hate Mondays". A small note pinned to a wall asks: "If there is an all-powerful creator, why does he draw so much suffering?" It is both a teasing and a profound question: hinting at the power which derives from an anonymous artist's triumph over the establishment (he has after all managed to take over a city's entire art gallery), but also challenging those who come to the exhibition hoping to be amused, entertained and diverted, but not to be confronted, challenged and unsettled. The answer to that question is as elusive as the artist, but it suggests that, if we value the subversive truthfulness of these images, then we must also be willing to confront the misery which the hypocrisy of some of our accepted norms and values allows us to gloss over. Upstairs, the balance of humour and politics shifts gear as the visitor embarks on a treasure-hunt to find signs of Banksy amidst the museum's regular exhibits. The gypsy caravan which has delighted generations of children has an eviction notice taped to the door. My sons spotted a bong with a supply of weed amidst a cabinet of family tea- and coffee-services. In one painting, the Madonna and child are listening to an iPod; in another, a woman has stepped out from among her companions in Millet's painting, The Gleaners, to perch on the edge of the frame and smoke a cigarette. A painting of two men in a boat has tilted and the water complete with boat is pouring out of the edge of the frame. 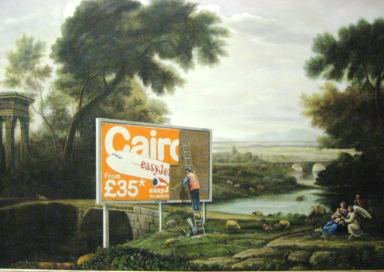 My favourite is one in which a hoarding advertising Easyjet flights to Cairo has been juxtaposed on a reproduction of Claude Lorrain's The Rest on the Flight into Egypt. As we left the museum, the queues were beginning to coil around the entrance lobby and extended far back down the street. A police car was parked on the pavement and five policemen were clustered around some people at the entrance. With the fullness of the exhibition in our minds, the incident looked like a comment on what we had just seen - a benign presence perhaps, but the exhibition cautions against the pervasive presence of men in uniforms which has become such a feature of British society. 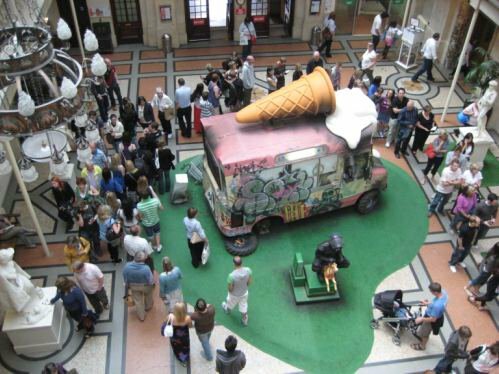 Banksy Versus Bristol Museum carves out a space of freedom in this beautiful city. The artist reminds us of how much we have to lose and that we have something worth fighting for. His policemen in riot-gear frolicking through green fields or riding atop a miniature fairground-pony invite a shock of delighted recognition at the absurdity of the powerful, shadowed by awareness of the vulnerability of those they trample upon and exploit; such installations confirm that humour and laughter can be the most subversive of weapons. In a country where private-security guards can molest an old man in the street and get away with it, more than ever we need Banksy with his public generosity, his biting wit, his moral outrage, his inspired political imagination, and his often tender gaze on the foibles of his fellow human beings. This exhibition is a message for and from another possible world.